Find here Original UGG Boots coupons, vouchers and deals. Original UGG Boots manufacture the finest quality sheepskin UGG boots. Our factory is located in Braeside, Vic. We have a brand new website with more and more new products being added every single week. 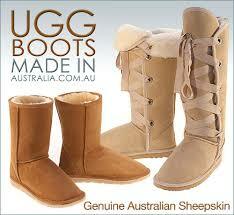 Original UGG Boots have over 30 years experience manufacturing sheepskin UGG boots in Australia. Some UGG boot companies import their product, some of it isn’t even sheepskin. Some even have Australia in their name and are made offshore. We are a transparent company. We make the finest Aussie made UGG boots and deliver to Australia & the world. We are 100% committed to quality and customer service. Many years went into research and development to perfect the products that we currently offer. Every single pair of UGG boots go through no less than 7 different stages in the manufacturing process. At each station master craftsmen (and women) add their part to the production all while keeping the highest possible quality standards.